I've got an used "Cyco" bicycle, orignally sold by the discounter Aldi.de in 2006; that the label sounds like psycho reveals either humor or ignorance . . . anyway. It hasn't been hardly used, so it looks brand new. It is an overcomplicated city-bike, with a lot of nifty details but aren't done really with the required care. 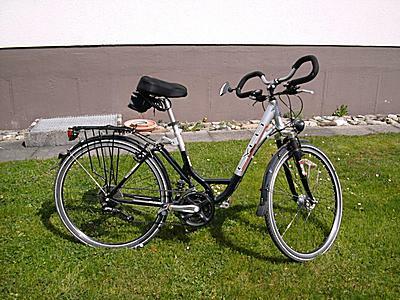 It is like a cheap or low-cost immitate of a high end city-bike. In particular I personaly dislike the gear change handles, you have to push multiple times to change multiple gear, there is no way to make quick changes - one button to push up one gear, another button to push down one gear. This maybe was once hype, but for me way too tricky and cumbersome - rather prefere a gear changer mounted direct at the steering bar operational with one finger.